Okay, I won’t profess to be one of those ‘I never eat fast food’ people because then I would be a liar. The reality is, as much as I try to avoid it…sometimes the convenience game wins and the golden arches are a calling. Those fries are also wicked delicious and lets just say…my love for the chicken nugget goes way back!! Dunking those golden gems in to your own personalized little tub of sweet and sour sauce is awesome. I know i’m not alone, you can say what you want, I know it ain’t good for you but man every so often having a 6 pack of nuggets and some pomme frites, is awesome! It still cracks me up that my bro tried to order one hundo nuggets once but that’s another story! If you are the creator of or caretaker for a little human, you probably know that toddlers love the heck outta the chicken nugget. Seriously, if I let the lion…he would eat chicken fingers or nuggets 5 days a week, he loves them that much. I’m not gonna lie…some weeks he does have them twice a week because mama just don’t want to battle the titan toddler…and I can normally get him to have them with a side of broccoli so it’s all about balance baby! 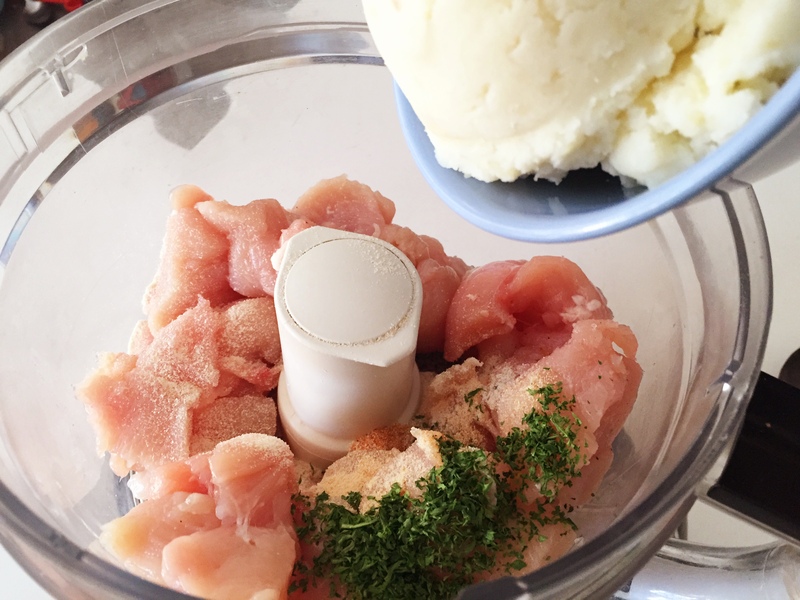 Today, i’m stocking up and making a batch of chicken nuggets that really stand up in the freezer and I know every single ingredient and feel pretty okay with what’s in them. 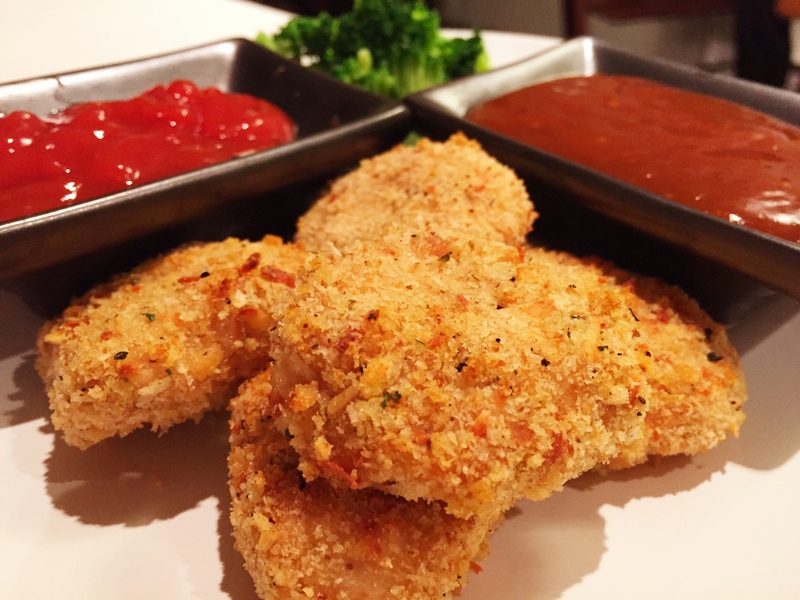 This recipe is super easy to make and will get you set up with about 30 nuggets (and I made mine on the larger side because as you all know…biggie smalls over here would eat me out of house and home). 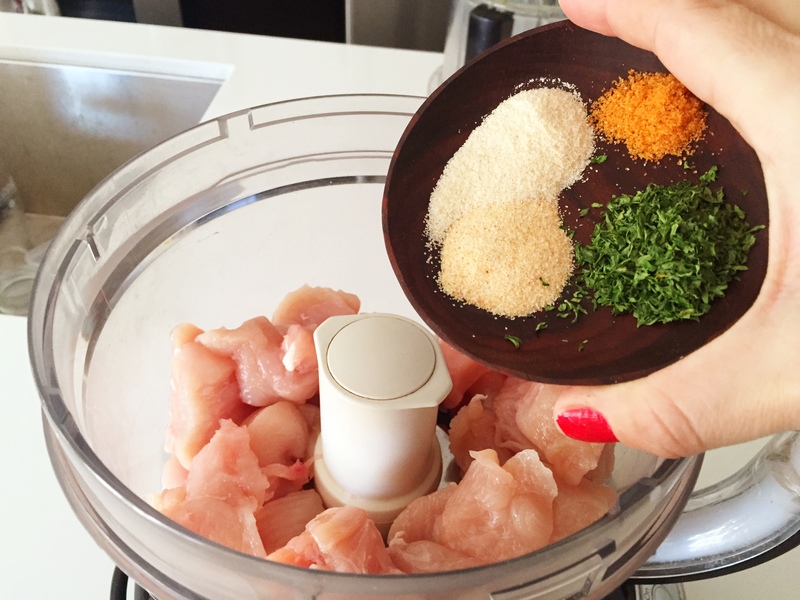 We are going to turn these simple ingredients into awesome chicken nuggets that beat the snot outta the fast food ones. I can pronounce every single one of these ingredients. You will notice that I am using some mashed potatoes in this dish…yup, that’s right mashed potatoes. 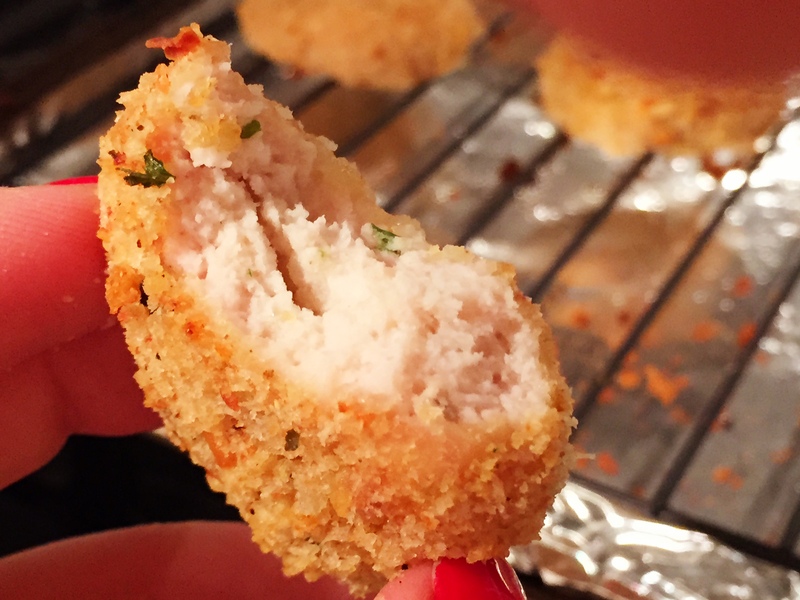 This is a great meal to make when you need to use up left overs and it really makes the chicken nugget mixture nice and soft inside. 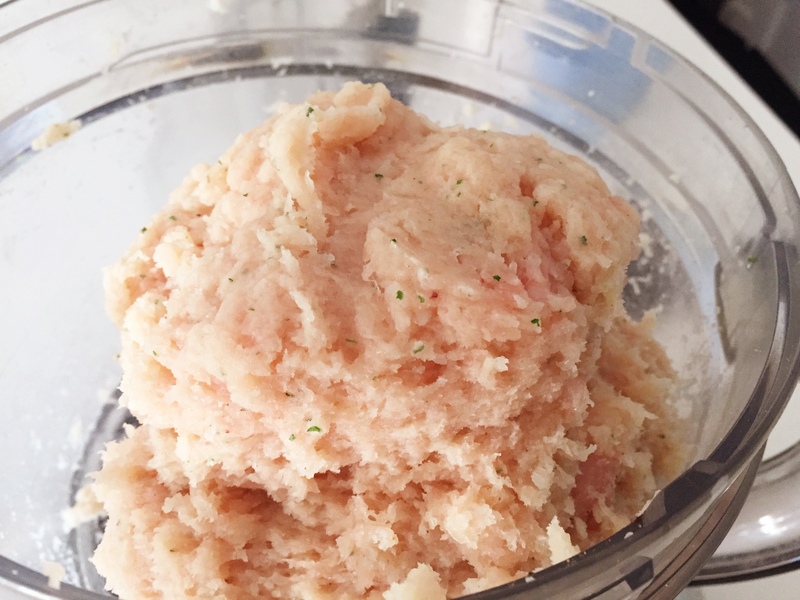 Place all of your ingredients (except breadcrumbs and cheese) in to your food processor…and let it do the work. You are busy being super awesome so it’s best not to over do it!! Pulse until everything is well combined. Here’s what it looks like when it’s combined. It literally took 20 seconds to complete this step!! 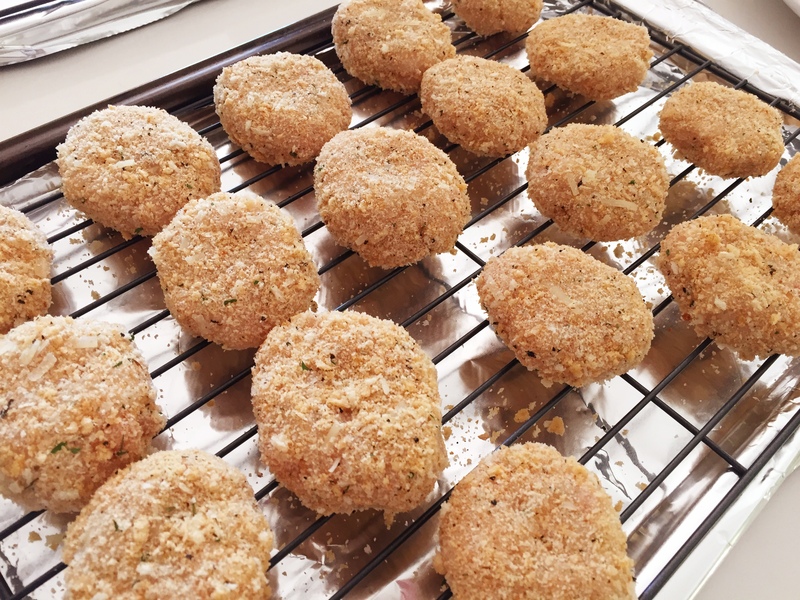 Next, you want to have your breadcrumbs and cheese on a plate or shallow dish and have your cookie sheets lined with tin foil (less messy) and a wire rack on top as you will be setting the nuggets on the rack. 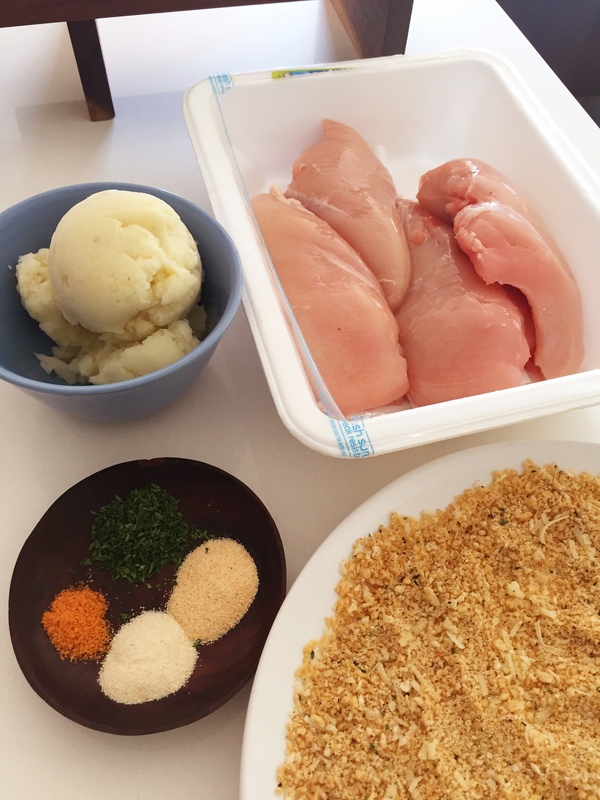 I am using a combination of panko and regular breadcrumbs because I find that panko (when baked) can burn a bit so I chose to mix two different kinds of breadcrumbs. 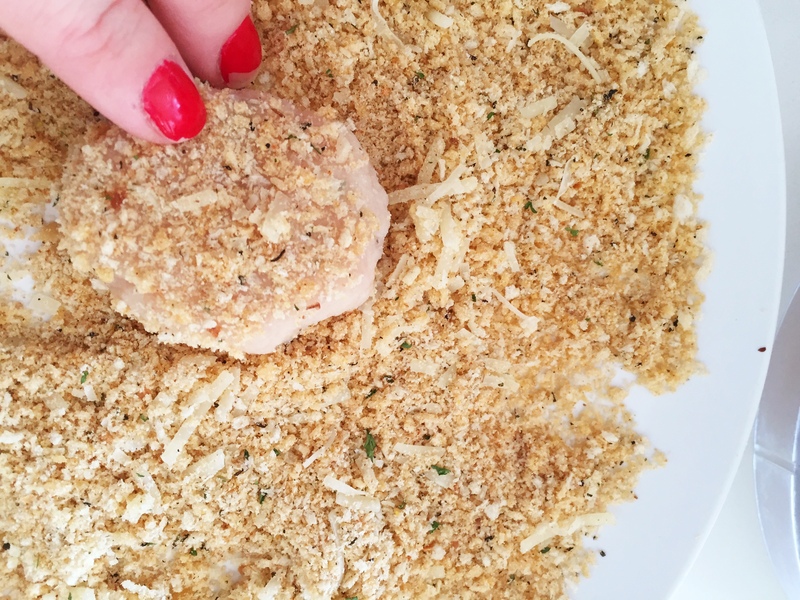 Also, if you don’t want to use seasoned breadcrumbs, just use plain ones. You know your taste buds better than I do, so bread em the way you want to. 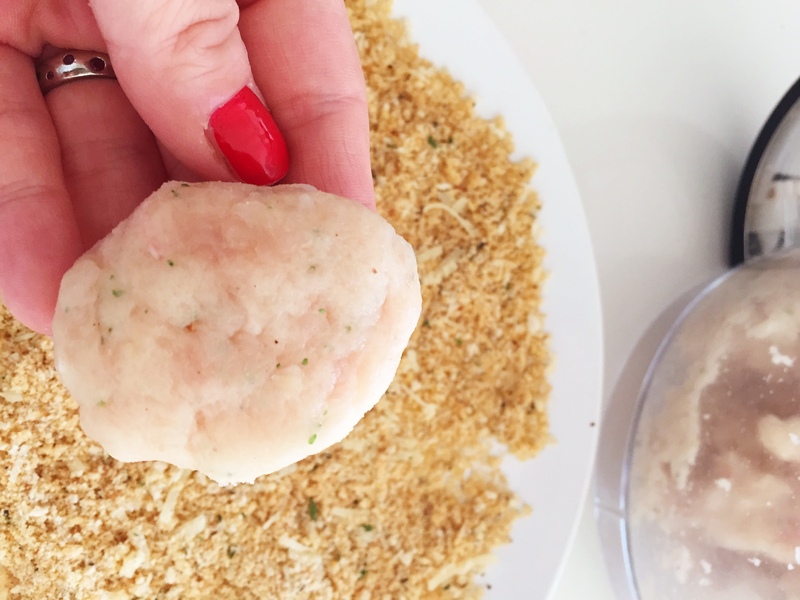 Take a Tablespoon of the mixture and with your hands you want to form it in to a shape that resembles the chicken nugget. Make sure you coat the sides of the nugget too. 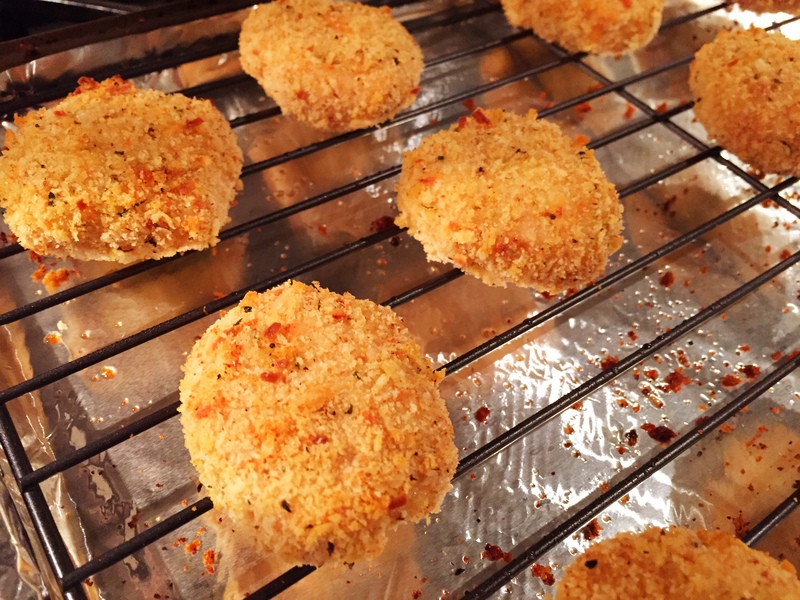 If cooking right away, spray the nuggets with a bit of cooking spray or spray olive oil and pop in to a 375 degree oven for 20-23 minutes or until cooked and your desired level of golden brown. *Sometimes if you want them uber crispy…put the broiler on for a few minutes…just be sure to watch that they don’t burn. 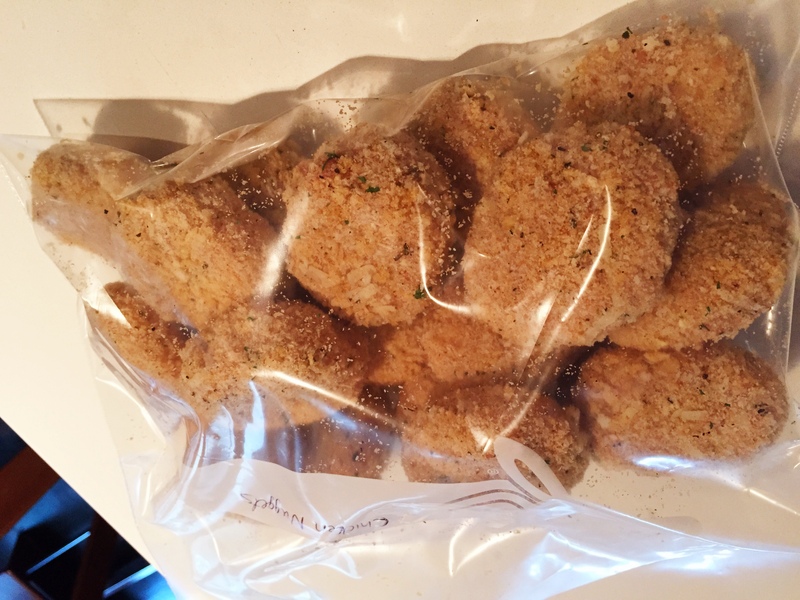 Place the cookie sheet of nuggets in to the freezer for 1 hour. Remove from freezer and pop in to a large zip loc bag. These will hold up for a few months. When cooking from frozen, you can cook them at 375 for about 25-30 minutes. Just watch them as they could be done around the 25 minute mark. Pop em in to a zip loc bag! Seriously people, check these out…toddler dinner winner me thinks!! Load the little monster up with their favourite dipping sauce and give yourself a high five! I made this batch today and kept some for dinner and froze the rest so I can be ready for the Hangry Toddler when it hits! Using a tablespoon, take a spoonful of the chicken mixture and using your hands start to form it in to the shape of a nugget. Place on wire rack on a cookie sheet. Bake at 375 for 20-23 minutes until cooked and golden brown. *Broil for a a few minutes if you want them more crunchy. 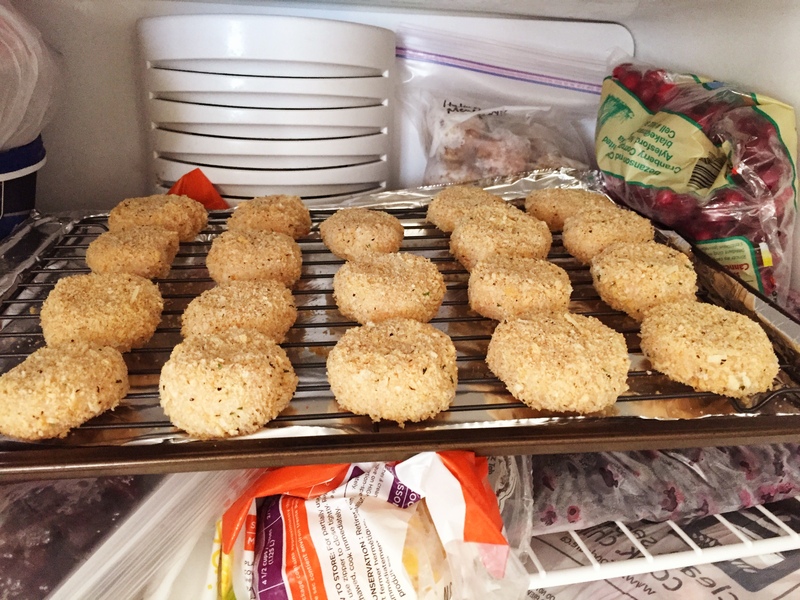 If you want to freeze the nuggets, place on a cookie sheet after step 3 and then freeze them on the cookie sheet for 1 hour. After the hour, pop them in to a large ziploc bag. *When it’s time to cook them, still bake them at 375 but up the baking time slightly to about 25-30 minutes. Alright lovely people…this is a great meal that you can be happy feeding your toddler (or yourself after a solid night out with friends and a few pops). Prepping in advance and having this ready to go in your freezer will save tonnes of time, frustration and money. Best of luck my moody little compadres! !